BISE was established under the Punjab Boards of Intermediate & Secondary Education Act 1976. On October 14, 1982, its jurisdiction was notified. In the supplementary examination of 1983, it started functioning by conducting its first secondary school examination. Its chief characteristics are to ensure smooth conduct of secondary and higher secondary examinations, affiliation of public and private institutions, register new students for conducting their exam, provides certificates to its passing candidates and NOCs, corrections in names etc., rechecking, provide result cards, rechecking of answer books, provide result cards after exams, duplicate result cards/certificates, migration certificates, arranges for co-curricular activities, provision of medals, scholarships, awards, laptop to candidates etc., migration certificates etc. 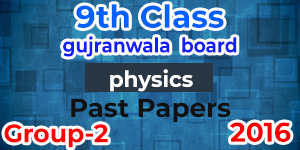 To provide 9th class past papers of Gujranwala is one of our key features which help the students across Gujranwala board to get the help from the past papers and get as many marks as possible.